Gables Bike Day is set to return to Downtown Coral Gables this spring for its seventh year. The all-day event, which celebrates biking and walking, will run from 12 noon to 4p.m. on Sunday, March 25th. This year, the focus of the event is to create a safe space for the community to walk and bike. 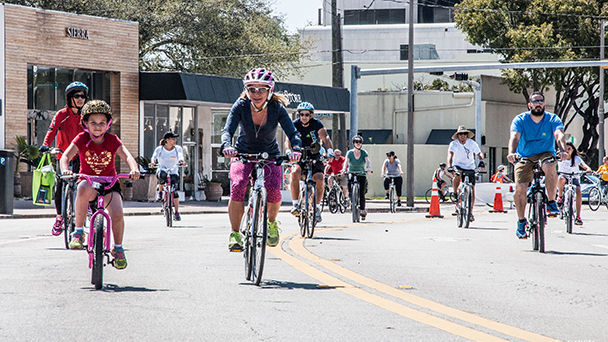 Gables Bike Day will feature bike tours, exercise classes, music, kids' bounce houses and a citywide scavenger hunt along with many more surprises. This family-fun day is made possible by the financial support of local sponsors and the City of Coral Gables. The event will be organized by Bike Walk Coral Gables (BWCG). The epicenter of Gables Bike Day will be in the park across from the historic Coral Gables City Hall, with car-free streets on Biltmore Way and Andalusia, from Le Jeune Road to Segovia Street. Food trucks will offer a variety of lunch options, and free bike valet will be offered by Green Mobility Network. An event stage will host music from radio station Shake 108 FM, exercise classes, and a variety of giveaways. BikeSafe, a University of Miami program, will host a bike rodeo to teach kids how to ride their bikes safely and follow the rules of the road. Children can also enjoy complimentary bounce houses, arts and crafts, and other family-friendly activities. Bike tours will be scheduled hourly, departing to points of interests and local landmarks nearby in Coral Gables neighborhoods. These tours are led by trained ride leaders on safe routes and guided by local experts. Tour space will be limited; interested participants are encouraged to register early in the day.